Long time no see! I know, I got lost again. Unfortunately, a lot of thigs have happened this past year, and it has been impossible to dedicate any time to the blog. 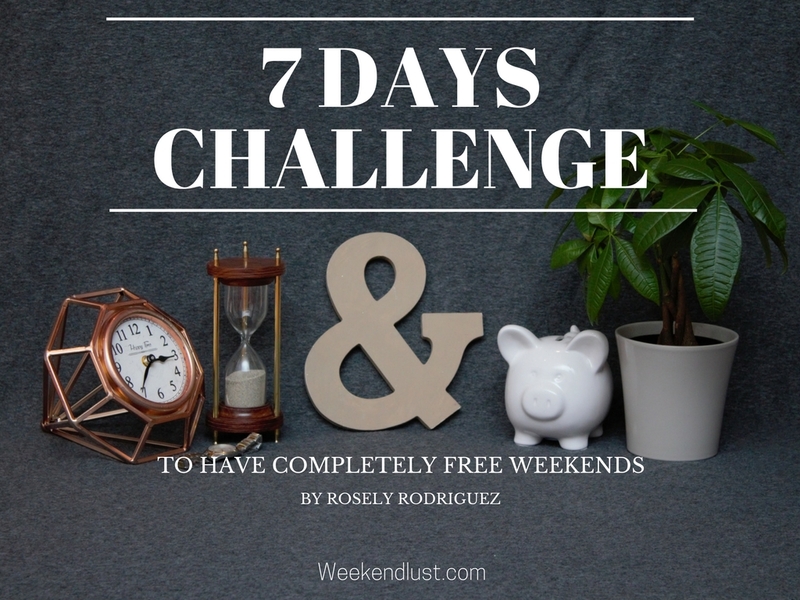 Since I won’t be able to deliver all the tips biweekly as promised, I’m removing the sign-up form and posting here my free “7 Days Challenge to Have Completely Free Weekends” as the last post on this blog. There’s no point on collecting more emails if I won’t provide you with the information you are signing for. However, you can still beneficiated from this content. Although this is a “good bye” post, I will keep Weekendlust alive. It means too much to me to turn it down. It held me accountable when I did this challenge myself, back when the blog was created. You just don’t understand where your time and money go! For a long time you have been wanting to start eating healthier, workout, to travel, start a career, learn a new language, land a new job, but you just don’t have the time and/or money to do it. Well, you are wrong! You do have the time and enough money to check off your wish list. I used to have this blockage in my mind about two years ago, but by following these seven strategies and free resources I made it possible for myself to, more than saving money, save my biggest asset: Time. My goal was to fit all my responsibilities during weekdays and have my weekends off for new adventures. What is yours? There’s no more time to waste, let’s get your weekends back! Side Note: Although this email sequence is just for seven days, this project might take you months to get used to and take advantage from it. Don’t approach them all at once. Every day download the apps and resources advised, play with them, and start using them in full once the 7 days have past. Day #1: Find out where your time and money are going. Let’s start with the million dollar question: Where is your time and money going? We are so used to our routines that we take for granted the “small activities” or “insignificant expenses” (as we usually describe them to justify ourselves) stealing our time and money from us. These small, tiny, little things/actions, with time, compound to a bigger problem. That being said, today’s challenge is to track these consumers of our time and money down. As simple as it sounds, but not as easy. You have to meticulously count each minute and dollar you spent. I would suggest to monitor your everyday activities for a month, or 2 weeks the least. It’s better if you count things yearly, or the amount of time you set your goals for. For instance, if you workout at home you would save 15 Min of commute daily and $35 dollars monthly. Considering that you would like to workout 5 days a week, you would save 2.71 days and $420 dollars every year (I’ll show you how to do this as part of the last challenge). Mint: This app is awesome! And as all apps and resources share on this email series, it’s free! You link all your bank accounts to the app to have all your transactions consolidated in one place. If you don’t have a bank accounts or credit card, or you decide to pay something cash, you can still add them manually, so you won’t leave anything out. It will also send you a report every week to let you know where your money went (just what we needed). Their blog it attached to the app, and the posts are very helpful as well. RescueTime: Similar to mint, but with time. It’s a free time management tool that will tell you the amount of time you spent on what on your phone or computer. Plus you can start a timer when you are about to start an activity, and when you are done it will keep it on the app. Measure everything! For real, every single little thing! Cleaning your house, walking out your dog, grocery shopping, and all the things you do throughout a month. The app will give you a report of all of them. It will make you open your eyes. I found out that I was procrastinating too much and using my phone to fill up the time. Ok, by now you have tracked all your responsibilities and expenses. While you do this, you started noticing what you can’t live without, and what is really a waste of your time/money. Cut EVERITHING you can live without. Only leave on your inventory the activities and expenses what you absolutely need. I know, I know. It’s hard to let it go, you really, really like it! But it doesn’t have to be forever. As soon as you get back on your feet, and accomplish your goal, you can gradually go back for the things you miss. Chances are you won’t miss them at all, as it happened to me. A good technique to survive, is to think of what motivated you to cut your expenses and make the time in the first place. Put things on a scale and tell me, what has the bigger weight? In my case, as an example, I think on how many days can I stay on a particular destination with the amount of money I would saved for the year. I thought of this by reading a post from Nomadic Matt, where he expose 5 destinations you can travel for $30 dollars or less per day. If we take the example of the gym, with the $420 Dollars saved, I can stay for 14 days in Thailand, Bali, Greece, Central America or Budapest! With the 15 min saved per day, I can start looking for a good air fair deal. I don’t know about you, but my adventures weigh far more than what my time and money thieves did. When trying to get back your time & money, it is a must to be organized. Not only agenda, but planners, calendars, alarm clocks, post it and everything similar to that. It was a little hard for me to get used to following an agenda, but as every new habit, with a month of practice I got used to it. I go more for handwritten stuff, so before 2016 started I bought a planner and scheduled most of the things I wanted to accomplish and when. I set up some alarms as reminders and updated my google calendar widget on my phone. Then I was facing the inconvenience of not being able to bring my planner everywhere. For this I’ve found the apps below very complete. TimeTune: It allows you to create your routine and add your daily activities to it. Control activities with amazing notifications and custom tags. Use the reminders option for other non-routine activities. Check your statistics to analyze and improve your distribution of time. One drive: To access Word and Excell Online. For me not to forget any idea or create to do lists, I started using this tool quite often. What I like the most is to be able to access to the same document from my phone and computer. Lost your phone? Your computer gets damage? No biggi, go borrow your brother’s and still have access through your email. Mint: Yes, Mint again, and till the end of the days. Now you are ready to use another feature of this app, budgeting. Mint allows you to set budget for every type of expense on a monthly basis. If you exceed the amount you set, the app will send you a notification and email to let alert you. Organization and preparation it’s key. Having your goals written and setting reminders will keep you on track. Money does not buy happiness, totally agree with that. But it allows us do things and go places that will bring us pretty close. While you don’t need to make a fortune to live a happy life, you do need to use wisely what you have so you can save more, and save time as well. First, be reminded to “Never spend your money before you earn it”. Thanks Thomas Jefferson for this advice! Second, automate your bill payments. Set your bank account to pay your bills before they are due. This will avoid for you to incur on late payment fees and damage your credit, plus you won’t have to log in too often to save time. Third, prepare for rainy days. Consider to open an online savings account. What I like the most of my online savings account, is that when I transfer money to it I can pretend that I really don’t have it, and my thoughts of using it earlier than planned has lowered a lot. Besides that, it gives me a lot more interest than the regular bank ones. The online bank where I currently have my savings account gives me a APR of 0.95, while my local bank was giving me just a 0.01 APR. Do your research and investigate which is more convenient for you. Forth, find a finance expert to follow. I’m sharing what I did to start. Once you feel comfortable with these steps, there could be a lot of other good advices for your particular case. I would recommend The Money Girl podcast by Laura Adams, you can find the complete archives of episodes at Quickanddirtytips.com. For more recent episodes, you can also listen to her advice through platforms such as Spotify mobile app, Stitcher and iTunes. I love podcasts because I can listen to them while I’m doing activities that don’t need much of my attention, taking advantage to nurture myself in every action I take. I listen to podcast like The Money Girl while driving, housekeeping, cooking and running. Saving time again. We are almost done with the challenges! Just 3 more steps to go. I’m proud that you are taking control of your time and finances to accomplish that goal! I feel like going back to day three though: Organization. If you are like me, and you get so lost in time and debts, organization is not your strength. You see, I realized back then that cutting just activities and expenses was not being enough. I still felt drowned in time most of all, I needed to go deeper. After some research, and reading the book Stuffocation, by James Wallman (read more about this term and experientialism on Weekendlust Start Here page, Source #1), I figured what was missing: I had too many stuff to manage and think about. That’s why I would recommend for today’s challenge to avoid mental fatigue and simplifiy your life! I took all unnecessary decor and excess of clothing and had a garage sale. What was left was donated. Just with removing the decoration, I’m saving 1 hour per week by having less to clean and to keep organized. I also feel that the house doesn’t get as dirty. On clothing, I created a capsule wardrobe. This helped me save time shopping, doing laundry, organizing again, and deciding what to wear. Add another extra hour to my week. 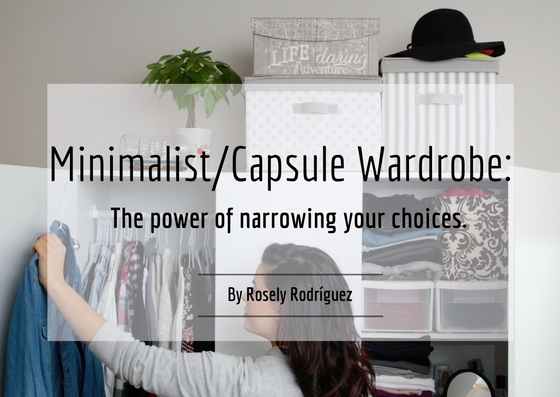 You can join my free online class on Sillshare.com “Minimalist/Capsule Wardrobe: The Power of Narrowing Your Choices” to learn more about this concept, or read the blog post Minimalist/Capsule Wardrobe: The Project. It also made me save money. I’m buying less, my electricity, gas and water bills went down, along with detergent supply expenses, and donating all my excess of clothing might get me an extra tax reduction as well, I got a receipt to try this out. At the end of this process, I realized I was spending too much money and time on HAVING things, when all I really wanted was to DO things. Keep in mind that you can reduce stuff in every aspect of your lives, not just apparel or decor. It will most likely help you save time and money, avoid physical and mental fatigue, and help saving our planet. I encourage you to dig deeper on the subject. Day #6: Explore the posibility of moving to a closer to work and smaller place. I hope you have seen with good eye the previous advice. Specially since I know it’s very hard for a lot of people to let go of things. I promise once you try it you will never look back. And once you embrace it, do you need that much space and high rent where you live anyway? You could also ask yourself, am I losing too much time commuting to work, college or where you frequently go? If you live far from work, consider moving closer. If moving is not a possibility, change your job then. Also, the smaller the space where you live, the less stuff you’ll have, and the less efforts to clean and organize. The challenge is not to move yet, the challenge is to give thought at the possibility. To consider all your options. Look through job hunting and housing websites. Think if your job could be done from home, at least half time. Would your boss accept it? Ask Google anything related to this and give it a look at least. We made it to the end of the challenge series! Health is very important, so being cheap with what fuels your body, food, at least to me, is not an option. It could be very time consuming. Trust me, I know. Even more if you don’t like to cook (guilty). But organization will help you go through this too. Planing meals weekly or biweekly. Instead of buying food everyday near work, I started cooking and meal prepping. Plan what you are eating for one to two weeks and make a list. Yummly: Cooking everyday is highly time consuming, if you can avoid it please do. But even if you can’t because you have kids or you just simply like eating fresh every day, this app is also for you. From what I understand, different cooking bloggers and food brands sign up to the app and provide delicious and convenient recipes of all types. Before going to the supermarket you decide the recipes you will have for the week and the app will create a shopping list for you! Everytime you find an ingredient or if you have at home already, you check them off the list. This will for sure save you time and money when going to the supermarket, because you will only go to the products you need, and avoid buying things that will get rotten because you never ate them. You also want to keep your body moving and have the cardio your heart needs. Remember my example on the very first challenge? Here’s how I do it. Nike + Training Club app: I must have more than 4 years now using this app, and now I love it more than ever. It’s joining Nike Running app and allowing you to do only bodyweight workouts and more yoga. Perfect to workout at home. You create a profile on the app, and it provides you with a plan for four to eight weeks. After every workout it ask you the amount of effort you put, and by the end of the week it will evaluate the information you provide to schedule the following week according to your performance. If you do all workouts on the date scheduled, and on the time expected, for the following week it will increase a little the workouts to achieve better results. With this app I’ve avoided expensive gym memberships and commute. I have no excuse snow. Also, explore High-intensity interval trainings. You don’t really need long hours on a gym to get in shape. The high intensity 15 to 30 workouts on Nike + Training Club app, when done right, will give you better results. Try to tell somebody what you want to do, so you’ll keep yourself accountable. It’s really helpful when you have somebody asking every now and then how is your plan going. Make it a game, and every time you accomplish something, reward yourself. Not with an item, but with an activity! Remember you shouldn’t approach the activities all at once. One step at a time, as advised on previous emails. Cheers to getting your weekends back and to collect more experiences!